It is no secret that I love fashion and jewelry! 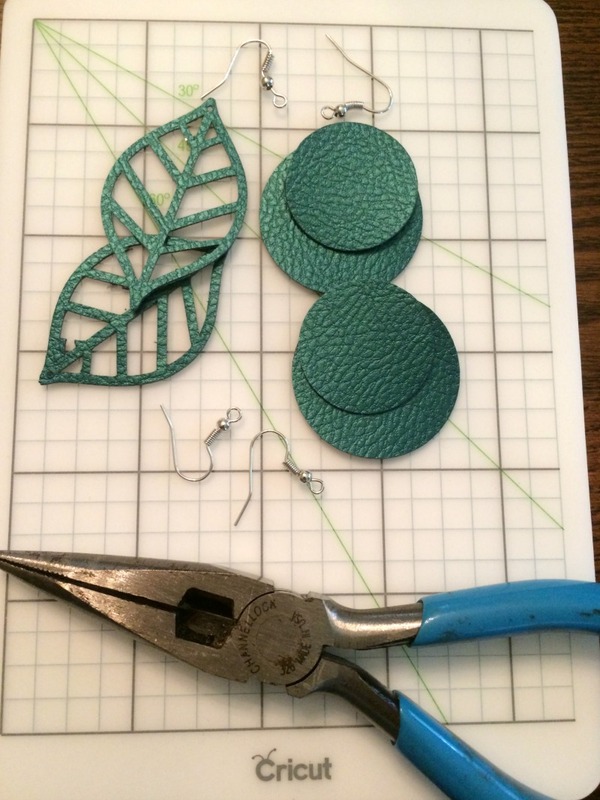 I have recently been using my Cricut to make earrings, necklaces, and decorative tassels using faux leather. It is so fun and addictive and you can easily make ready-made projects, like these faux leather earrings in the Cricut Design Space™ or design your own using the software! 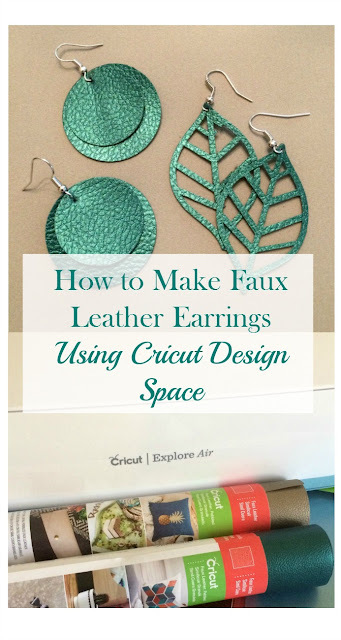 Today I am going to show you how I made two pair of faux leather earrings using the Cricut Design Space™. One is a "Make It Now" project and the other I created using the Shapes. 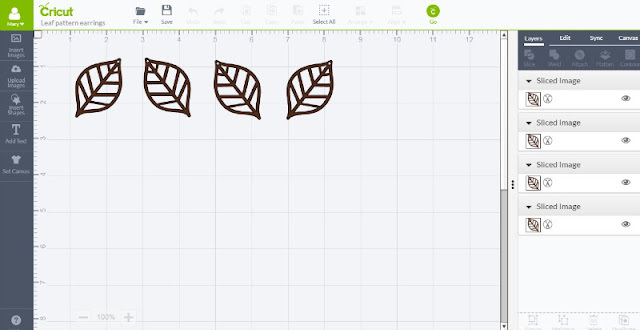 The great thing about the Cricut Design Space™ is that it is so easy to use. Most of the features are intuitive, allowing you to whip up a project in minutes. You can also get creative and customize a Make It Now project or design your own from scratch. Open up the Cricut Design Space™ and sign in. You can browse the projects or narrow down your search with the filter. 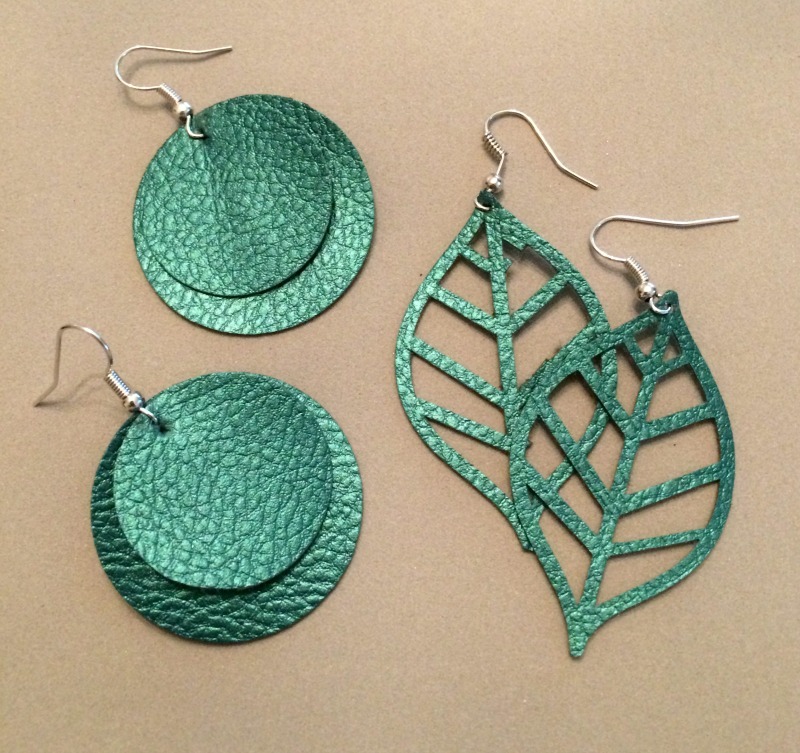 I searched on Fashion since I knew I wanted to make a pair of earrings and decided on a cutout leaf pair. Click on the Make It Now button in the bottom right corner. Set the dial on the machine to Custom and select Cricut Faux Leather from the list on the screen in Design Space. Cut out a piece of faux leather to fit the earrings and place it on the strong grip mat. I have tried the faux leather on the medium grip mat and it shifted and messed up the cut, so I definitely recommend using the strongest grip. After you have cut the earrings out, weed them from the mat, and attach the earring hardware using pliers. 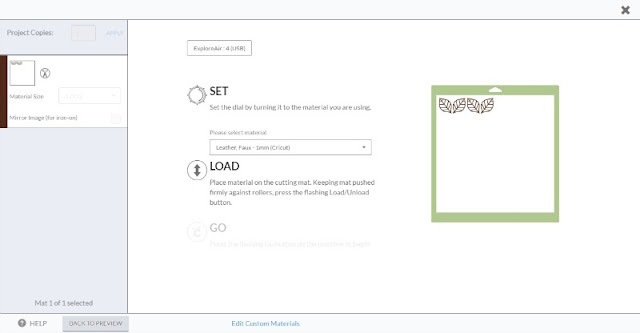 Open up the Cricut Design Space™ and click on Create New Project. 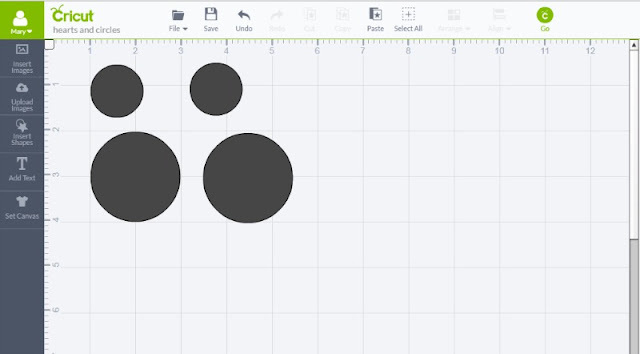 I am making a layered circle design, so I used the Insert Shapes option to add 4 circles of two different sizes. You can use the handles on the bottom right side of the box around the shape to size the earrings. Follow the instructions above for cutting the faux leather and finishing the earrings. Have you made your own, custom project using the Design Space? If so, let me know in the comments what you made! 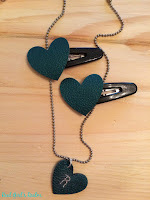 You may also like the DIY Barrettes and Pendant I made with faux leather! This is something I would LOVE to try!! I need to pin this to remind me to try it later! Is that the back of the leather that stays attached to the mat? Yes, When you "weed" the design, the parts you do not need stick to the mat and you can pull them off later. Can you tell me which blade is used to cut the leather and faux leather? I just got mine and haven’t set it up yet. I haven’t been able to find anywhere that says what blade should be used. I have just used the blade that comes in the machine. I have had it for about a year and a half and have not had to change it yet. Hi, do you use the regular blade (with the strong grip map) on the faux leather setting? Next to faux leather mine says "paper thin" and thats throwing me off. Its not really paper thin. Does your regular blade cut the mat a little bit? My deep cut blade/housing did. My material has been shifting even on the strong grip mat. Trying to master this. Thanks! Hi Elizabeth! When I made these, I used the regular blade on my Cricut Explore and the strong grip mat. I used the "faux leather 1mm Cricut" setting (I have a screen shot above) and it cut all the way through (along with the mat a little) You may need to clean your mat to bring the stickiness back if you use it a lot. You could also add masking tape around the edge to hold your leather on if you still have problems. What does the back of this look like? Is it that brownish color so it has a slight resemblance to real leather? You can see the back of the material in the pic where the leather is on the mat. It is a greyish/brown shade that does resemble the back of leather. Love this, thank you for sharing! I want to try this but I have a question. I am new to Cricut, just got a machine. How do you get the hole for where you attach your hardware? Does the machine cut it or is there a separate tool that is used. Thanks again! You can make the hole with your Cricut if you just insert a small circle at the top of your earrings, or you can poke it through, like I did. are these special earring hooks? I am having a hard time opening the ring and closing the ring.. it weakens the metal and when i bend it back in place it snaps off. No they are not special, I purchased them in the jewelry section of Walmart. 1) do you mirror image? Hi Renae, I did not mirror the image. Generally you only use that when you are doing an Iron On pattern. I did not have a problem cutting, but you could always send the mat back through to cut again or use a deep cut blade. Beautiful! Can you use genuine leather as well and if so do you need a special mat? Hi Rachelle, I actually used real leather in this post http://www.realgirlsrealm.com/2017/02/painted-leather-earrings-and-necklace.html but it did not cut all the way through. I had to finish it with scissors. It would probably work better with a deep cut blade and select the thickest material to cut. You can also send the mat through for a second cut, which I have done for other materials. You cut 4 leaves, so did you glue 2 of them together? No, I did not, I just cut multiple to make 2 pair of earrings. I haven’t tried the faux leather yet. Is it stiff enough that it doesn’t curl? I have purchased the faux suede, and while I haven’t tried making the earrings yet, it seems like it would curl once made into earrings. Hi Peggy! It is thinner than regular leather, but I have not found that they curl. I have had these for a year or so and have them hanging on my jewelry organizer when I am not wearing them. How did you get all the leather pieces off of your mat? My mat is a mess! I’m not sure how to get it clean. I have a plastic scraper tool that I use for smoothing out the transfer tape when using vinyl and that gets most of the pieces off. I have also seen other bloggers clean their mats with a soap solution. I am sure you can easily find it if you search on Pinterest or Google. Good luck! I make earrings using fabric will this machine cut fabric? I am thinking about getting one. This particular model does not have a blade to cut fabric, but the new Maker machine has a blade designed to cut fabric as well as all the other materials that the Explore can cut. I see you made these out of leather - where do you use vinyl, to decorate them? I use vinyl to customize thinks like trays, jars, crafting boxes, wall decor, mugs...the possibilities are endless. You can also use vinyl as a stencil to create handpainted signs and such. 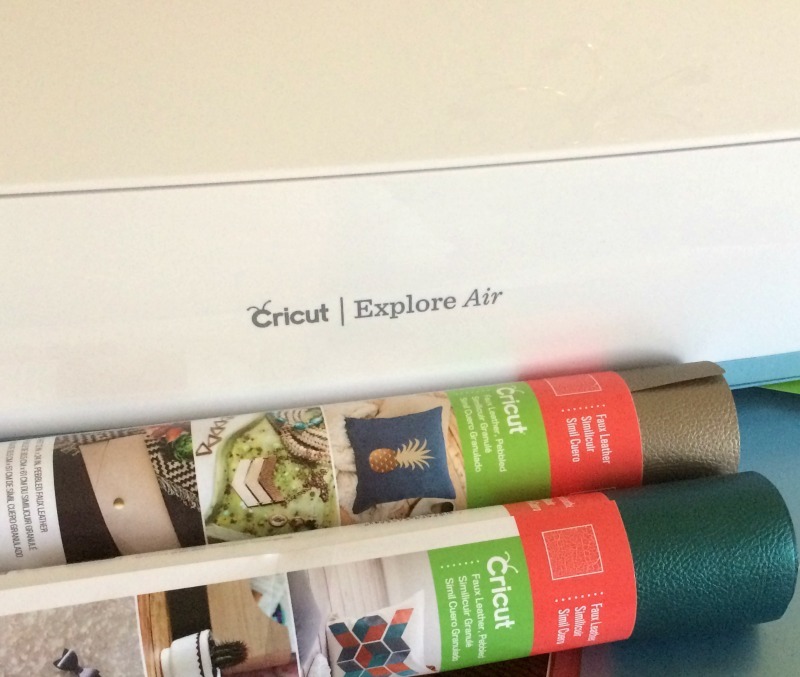 I have a ton of projects if you click my Cricut projects http://www.realgirlsrealm.com/search/label/Cricut and you can also find inspiration on Pinterest. 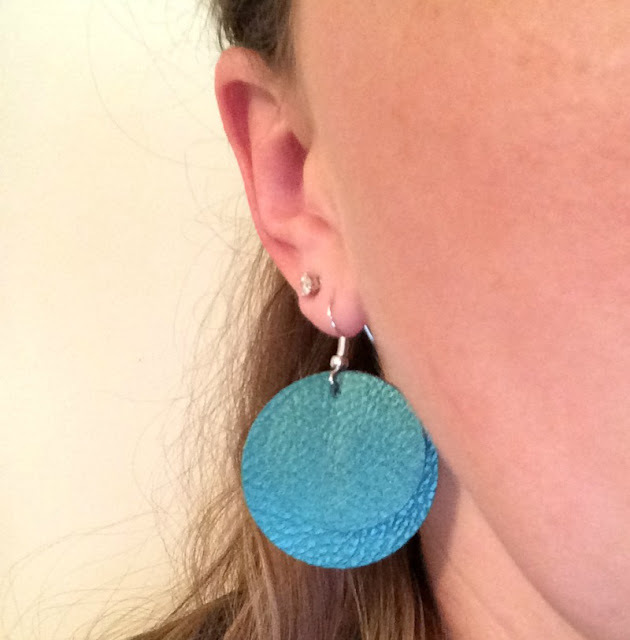 I've made several pair of earrings using the Cricut faux leather and suede. I've had issues with the cut leaving cut marks on the mat. Any suggestions? I also found faux leather rolls at Hobby Lobby in 7 different colors. I have done other projects with faux leather and mine also cuts through the mat. The new Maker machine allows you to change the pressure, but I have not tried that yet. I have the cricut maker and have bought some of the faux leather rolls from hobby lobby. I cannot get it to stick to anything. I have it on the strong grip mat and have used masking tape, duct tape and painters tape as has been suggested through internet searches and I cannot get anything to stick to it enough to stay stuck on the mat. Do either of you have any suggestions? Thank you. You definitely need to use the strong grip mat. I have not had trouble with it, but you could try putting the leather face down on the mat to help it stick better than the fuzzy side. Masking or painter tape should work as well...I have used it to hold chipboard while cutting on the Maker. It may also help to lay out the leather since it tends to want to roll up. I hope this helps! Very cute tutorial, and one I can't wait to try! Thank you for sharing it! A note I'd like to add about cutting the mat; I personally use the Cricut Maker, and it *does* also cut the mat, at least when I change it to add more pressure. I didn't notice that it did it with normal pressure. :) I work primarily with heavier materials, though, and use more pressure almost exclusively, so the marring of the mat hasn't been an issue for me - at least not yet, anyway. Hope that helps! Thanks for the update and the tips. I used a heaver pressure when using felt with the Maker and it left small indention in the mat, but nothing that caused damage. Can I do it on my own? We dont have Circuit machines. YES! 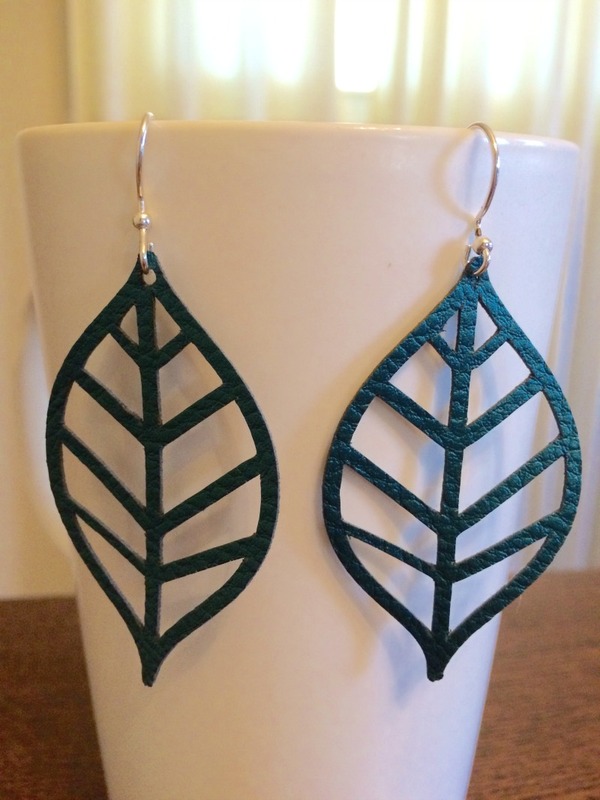 I have a friend that hand cuts leather to make earrings similar to this for her etsy shop. You could easily cut out any design you wanted by hand. The machine just makes it easier and quicker. Hi, what do you back the earring with, if anything? You do not have to back the earring with anything. Love it! Thanks for sharing! I love jewelry as well and this is one way of making it. Thank you! It is one of my favorite projects! With the Air 2, you can only use the faux leather, which is thinner than regular leather. I tried it with regular leather and the cut is not deep enough. You can however cut leather with the new Cricut Maker. 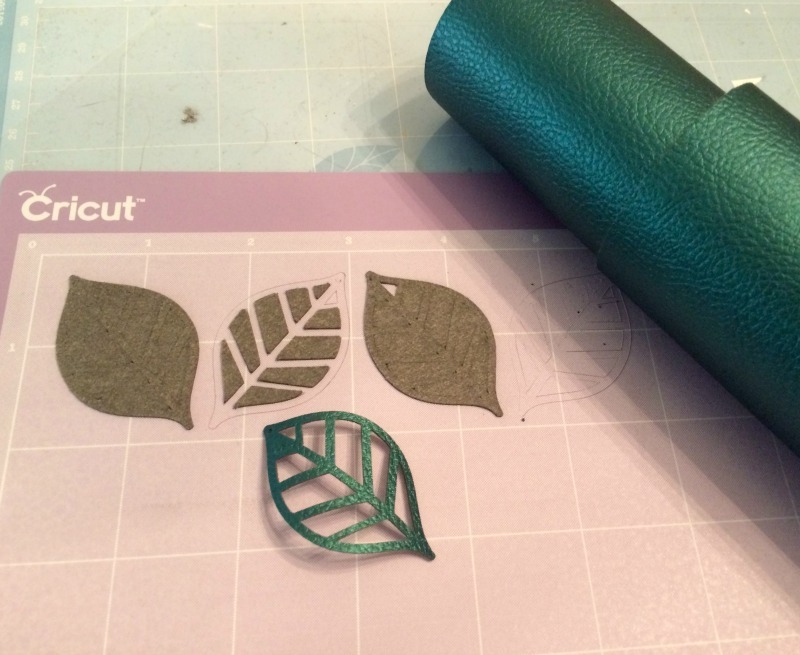 I have a Cricut One, and use the faux leather to make earrings. I have also had success using glitter or other iron-on to 'decorate' the faux leather earrings. I put a gold glitter leaf on a black pair of faux leather earrings, for example. And holographic iron-on really looks great on the faux leather. Yes, that is a great idea! I have used iron-on on faux leather ornaments.